I didn’t think that this wasn’t going to be on the cards. BMW thought otherwise! Imagine heading to the ski field with this X-rated set of wheels. Four-by-four is fast and furious and, in no uncertain terms, is forging the way forward for BMW’s highly desirable Sports SUV market. 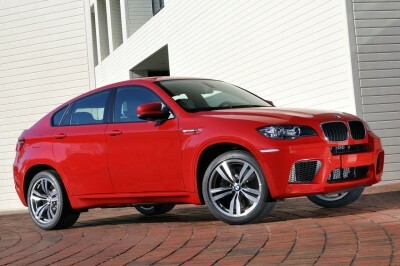 The BMW X6 M puts on an aggressive face at the front with large air intakes and a large front air dam. Look closely, and you’ll spy some gills in the front fenders, socking great big low profile tyres (275 Bridgestones at the front and 315 Bridgestones at the rear), beautifully crafted alloys, and at the rear the Motorsport X6 boasts quad exhaust tailpipes. All the outward appearances lead towards a ton of power under the hood. Enter the cockpit, and you’ll find impeccable build quality, sports leather seats, beautifully clear speedometer and rev-counter dials, a leather-bound chunky M steering wheel (great to hold), a dramatic dual-tone sweeping dash that looks outstanding, and all the luxury items inside the BMW X6 M cabin that would make a Bentley owner proud. BMW ensure us that the M is for real, and I have no mind to disagree. BMW are usually very accurate with their performance stats, and thus I can fully believe that the BMW X6 M will do the 0-100 km/h sprint in a sizzling 4.5 seconds. The X6 M has a six speed M-Sport Paddle-Shifted Automanual gearbox that transfers the driver’s intentions through to the AWD system at lightening speed. The AWD system boasts an electronic front and rear LSD. Having the pleasure of commanding such power under the bonnet would be a gratification for a select few – I would suppose. Waiting to pounce is a direct-injection BMW M Sport V8 that has huge Twin Garett turbochargers that force a 21.0 PSI pressure through the chambers. The piston-pumping 4.4 litre powerhouse manages a torque twist of 680 Nm from as low as 1500 rpm. This punch swings all the way through to 5650 rpm; and at 6000 rpm the full 415 kW impact is felt. Traction off-road is reported to be very good – so too is the BMW X6 M’s ability to handle ice. Certainly the standard X6 impresses both on the road and off it, and the touring ability of the Motorsport version promises to be quite phenomenal. BMW have created this machine as a four-seater Sports SUV. If you’re hanging out for one of these, you best hold off till later in 2010 before you trade up the old Land Cruiser for a BMW X6 M. Definitely worth a look if you want to see a Porsche Cayenne driver turn red! Or should that be green? For any more information on the BMW X6 M, or for that matter any other new car, contact one of our friendly consultants on 1300 303 181. If you’d like some fleet discount pricing (yes even for private buyers!) we can submit vehicle quote requests out to our national network of BMW dealers and come back with pricing within 24 hours. Private Fleet – car buying made easy!